Japanese car manufacturer Mazda has announced an expansion of its environmental initiatives by setting new efficiency, safety, and sustainability goals in the lead up to 2030. The companyâ€™s most significant development in this plan is a new generation of engines, dubbed Skyactiv-X, which will feature what Mazda claims is the first commercial petrol engine to use compression ignition technology. Known officially as Homogeneous Charge Compression Ignition (HCCI), the technology is something car manufacturers have been working on for decades. However, trouble with reliability and narrow powerbands have held up mass-scale implementation. An HCCI engine pressurises an air/fuel mixture until the heat from combustion causes it to detonate. This is the same theory employed by a diesel engine, which always relies on compression ignition. However, petrol-based compression ignition is not as easy to accomplish, with a number of reliability problems to solve. These include the risk of misfire at both high and low revolutions â€“ the engine cannot keep up at high revs, while at low revs, lower temperatures from less combustion per second can cause misfiring. On the other hand, the higher temperature and pressure in general of compression ignition can actually cause cooling challenges, and finally, the engines can be particular about the fuel they require, meaning differing levels of performance depending on the fuelâ€™s properties. 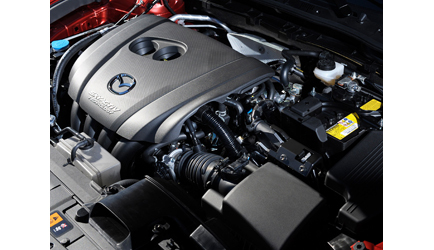 Mazdaâ€™s technology, which it calls Spark Controlled Compression Ignition, is a mix of both worlds. Implemented in the Skyactiv-X engine, it continues to employ spark plugs for situations where compression ignition doesnâ€™t work reliably, such as high revolutions. Otherwise, compression ignition can lead to up to a 30 per cent improvement in torque, fuel economy and emissions compared to Mazdaâ€™s current Skyactiv-G engines. Essentially, it would bring the high torque and fuel efficiency of a diesel to market, without the usual sooty emissions they are known for. Mazda expects to debut the Skyactiv-X engine in 2019, although it has not said which models would get the engine first.